What about your muffin top? Do you want to reduce it? With the right types of exercises and enough determination, you can shape your body and get rid of the flabby muffin top. 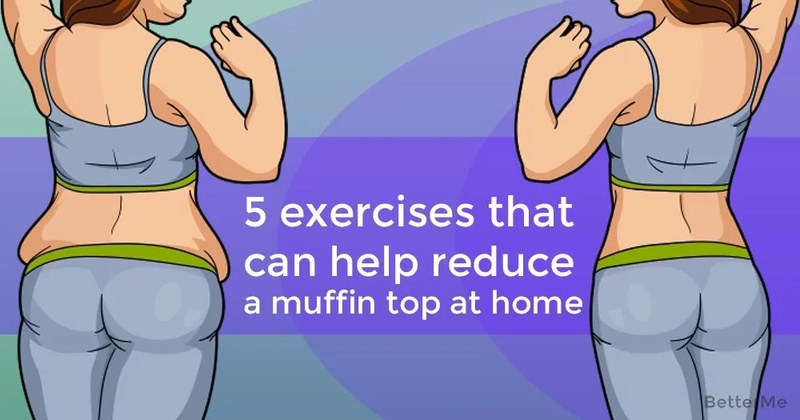 Today, we would like to present you with a list of 5 exercises that can help you reduce a muffin top at home. Well, our workout includes 5 exercises such as Plank (hold on for 30-45 seconds), Side Plank Bends Left and Right, Deep Squat Jumps (45 seconds), Jumping Lunges, and Mountain Climbers. You should perform these exercises for 30-45 seconds with a 10-15 second rest between each exercise and a one minute rest between each set. Perform 2-3 sets per session. What’s more, try to perform these exercises 3-4 times per week. However, if you want to speed up your results, you should combine this workout with a healthy diet. If you want to reduce muffin top, you need to add foods to your diet like nuts, spicy foods, peaches, chicken, oats, dark chocolate, beans, and vegetables. Also, do not forget to drink plenty of water, you need to consume 1 gallon of water daily. A combination of these 5 effective exercises and a healthy diet will lead you to perfect results. Roll out your mat and let’s do it! Scroll down to see how perform our exercises.